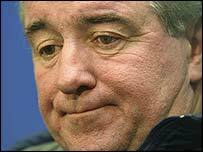 Leeds United have confirmed that manager Terry Venables has left the club. His departure was announced to the London Stock Exchange on Friday morning. "Leeds United would like to place on record its thanks to Terry for his contribution in difficult circumstances and to wish him success in the future," a club statement said. The Yorkshire club also confirmed that a permanent appointment will not be made until the summer. In the meantime Peter Reid, sacked as Sunderland boss earlier this season, has accepted a short-term position until the end of the season and is now favourite to land the full-time post. During a media conference to announce's Reid's appointment, Leeds chairman Peter Ridsdale all but confirmed that Venables had been sacked, rather than resigned. "It was the club's decision to make a change at this moment in time," he said. Ridsdale added: "it has been a difficult few months for Leeds United Football Club and I wish to thank Terry Venables for doing the job he did in difficult times. "Neither he nor I expected to have the roller-coaster ride we had but it is right and proper to thank him for the job he did. "I am absolutely delighted after a whirlwind morning that Peter was available and wanted to take on the challenge." Under Venables Leeds have slumped to 15th in the table. Leeds have lost four games in a row, including an embarrassing FA Cup exit to Yorkshire neighbours Sheffield United, who also knocked them out of the Worthington Cup. Venables took over from O'Leary in July 2002, but has seen several first-team players sold in an attempt to solve the club's financial crisis that saw their debts rising to £78m. Within a fortnight of him taking over star defender Rio Ferdinand was sold to rivals Manchester United. Jonathan Woodgate, Robbie Fowler, Lee Bowyer, Robbie Keane and Olivier Dacourt were also shipped out in a bid to balance the books. Venables was unhappy at seeing his squad ripped apart and Woodgate's £8m move to Newcastle led to him considering his position with the club. He decided to stay on until the end of the season, but results have gone from bad to worse since then and now Leeds have decided to end his reign. "Venables has won just ten games league games out of 30"